AC1200 Coherent Module - Acacia Communications, Inc. The AC1200 Coherent Module is based on our Pico digital signal processor (DSP) ASIC. 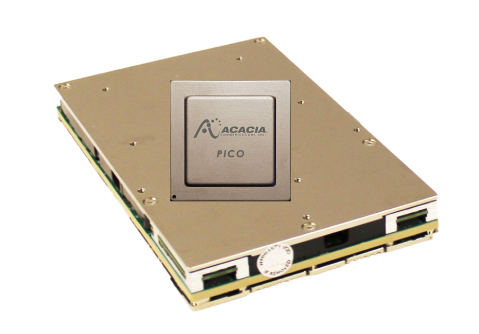 Utilizing two wavelengths, with up to 600 Gbps capacity each, Acacia’s AC1200 supports transmission speeds of up to 1.2 Tbps in a footprint which is 40% less than the size of a 5” x 7” module supporting 400 Gbps today. The versatile AC1200 will support multiple network applications, including Cloud/DCI, metro, long-haul and submarine. In addition to its higher capacity and density, Acacia’s AC1200 introduces several new key features designed to enable network operators to improve efficiency while reducing network costs. Fractional QAM Modulation provides users with the ability to select very fine resolution of QAM constellations for optimal capacity. And an Adaptive Baud Rate capability provides users with the ability of continuous baud rate adjustment to optimize utilization of available spectrum. Acacia’s AC1200 module will also support security encryption and a wide range of host interfaces designed to reduce or eliminate the need for costly external devices. Acacia will support its AC1200 with a software development kit designed to streamline the integration and allow customers to more quickly take advantage of this highly flexible solution. Co-optimization and short connection between the DSP ASIC and Optics provides high fidelity for the high speed interconnects. With samples planned to be available in first half of 2018, the AC1200 is well positioned to help carriers and content providers meet their growing bandwidth demands.